Last November, I attended the best wine dinner of my life. Bar none. Jesús Barquín was in Dublin to conduct a series of tastings of his Equipo Navazos sherries, and Ally Alpine from Celtic Whiskey Shop & Wines On The Green had kindly invited me to Etto, Merrion Row, Dublin. What followed was a superb tasting of some of the most exciting sherries on the market today with a selection of them later paired with Etto’s superb food. Before I recount my thoughts the evenings libations, I think it’s important to put my notes into context. Dinners like this don’t really lend themselves to writing tasting note tomes. Furthermore, some of the sherries presented at the tasting are of considerable complexity and average age, and any attempt to truly understand them in the context of a short tasting would be merely scratching the surface. I’ve been a committed Equipo Navazos devotee for a couple for years now, so I’m lucky enough to have bought bottles of all of these sherries upon their release and hope to blog more comprehensively about them over the coming months, even if trying to capture the true character of some these treasures in a blog post admittedly does strike me as faintly ridiculous. The Equipo Navazos story is well documented. The group, founded by Jesús and Eduardo Ojeda, has gone from strength to strength with over 50 releases to their name, not to mention collaborations with Dirk Niepoort and Colet Vins. The original model of finding unique casks and bottling them with minimal filtration or treatments still exists but has also evolved into an increasingly collaborative approach with certain bodegas to develop and release rare and interesting wines. 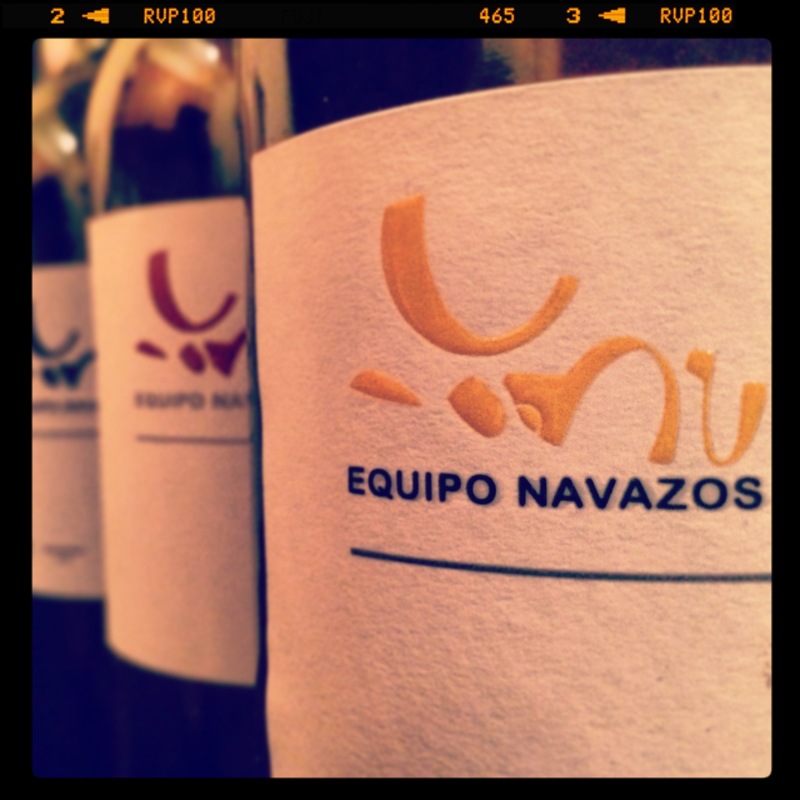 The evening started with an Equipo Navazos white wine release – La Bota No. 53 Florpower MMX “Más Allá”. When I first tasted La Bota No. 44, I felt it had a hint of aged white Rioja about it – like the folks at López de Heredia had made some wine during a summer holiday to Jerez. More recent bottles have shown a deeper orange colour – a more ‘sherrified’ character if you will and have probably put on some weight with age in the wine version of mid-life spread. No. 53 is made entirely from the cold 2010 vintage with the majority of the fruit sourced from the pago Miraflores. Fermentation took place in INOX tanks with a portion of the wine transferred to small 225L casks, which had been used for La Bota de Palo Cortado No. 52 (see below), before being returned to the INOX tanks for 2 years prior to bottling. The nose was creamy with some evidence of flor appearing. With an initial citrus hit, I felt the wine had much more acidity than No. 44; this was like manna from heaven for an acid fiend like me – very enjoyable indeed. 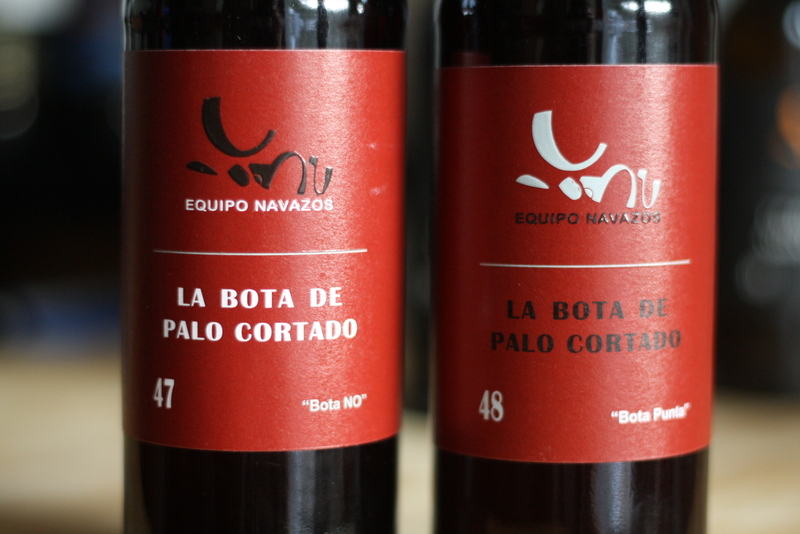 Equipo Navazos’ newest Palo Cortado release followed – La Bota de Palo Cortado No. 52 “Sanlúcar”. Jesús explained that this sherry has never aged under flor (except for an unavoidable, but brief, period of flor growth whilst in tank) and is bottled as a young palo cortado. Lots of sweet toffee and butterscotch notes on the nose with real bite on the palate. Focussed, elegant and quite light on its feet. Very long. We then moved slightly eastward to Montilla for two wines sourced from Pérez Barquero. La Bota de Fino (Amontillado) No. 45 showed a balanced nose with lots of intensity on a bitter palate with good persistence. Made from unfortified PX, there were some hints of oxidation here reinforcing the notion that this fino, with its 15-20 years of average age, was on its way to becoming a fully fledged amontillado. La Bota de Oloroso No. 46 was slightly older, averaging 25-30 years of age. Some nail varnish volatile aromas appeared on the nose. Powerful, spicy and again very long. Both of these sherries were later paired with Etto’s pork chop and romesco sauce (pic above), and it was with this pairing that the oloroso really sang. La Bota de Fino No. 54 is the next in the series of Equipo Navazos finos from Macharnudo Alto. These releases are fascinating – no two ever seem to be the same. This June 2014 bottling had lots of lift and freshness and seemed less weighty, full-on and powerful than my memory of La Bota No. 35, but Jesús remarked that he thought this sherry would also gain some more weight with time. As with its sister fino releases this sherry is from the Valdespino soleras, on this occasion a blending of butts from the 2nd criadera and the solera. 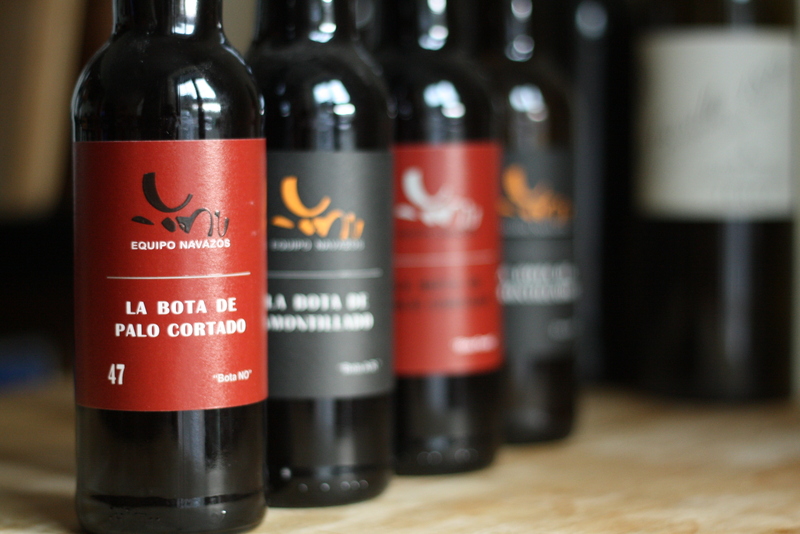 The Equipo Navazos Manzanilla Pasada releases from the pago of Miraflores are always stunning. To my mind they represent some of the best value releases in the portfolio, encompassing the excitement and thrill of the rarest sherries but also the drinkability of the ‘standard’ finos and manzanillas. On my first tasting a few months previously I felt La Bota de Manzanilla Pasada No. 50 “Bota Punta” might not have hit the heights of the previous release No. 40. Maybe that’s still the case, but I’m really just splitting hairs. As with releases No. 20 and 40, it’s sourced from the same bota punta in the solera which yielded No. 20, 30 and 39 (bota NO). There’s a hint of oxidation due to the high fill level of these particular casks in this solera and this, like its earlier brethren, exhibited a truly amazing salinity and precision. 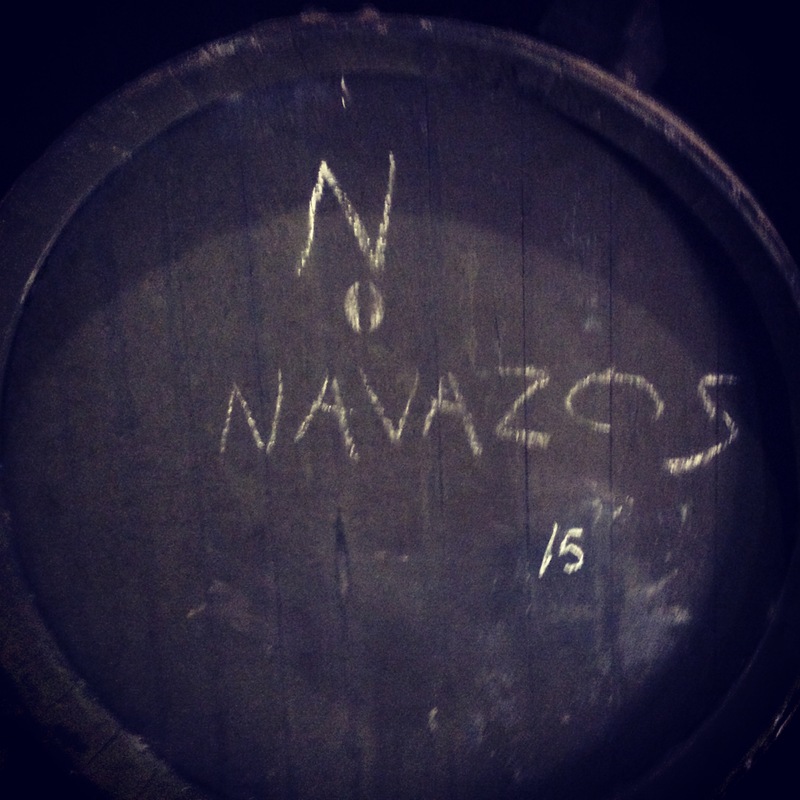 Equipo Navazos highlight that there’s a ‘steeliness’ to these sherries, and that characteristic really comes through in spades. Superb length and certainly in the shakeup for wine of the night. Next in the lineup were two sherries I am fortunate enough to now know very well: La Bota de Palo Cortado No. 34 “Pata de Gallina” No. 34 and La Bota de Amontillado No. 37. These sherries will always have a special place in my heart because along with La Bota de Manzanilla No. 32, they were my first introductions to Equipo Navazos. I was lucky enough to buy them in reasonable quantities so have been able to track their progress since release. La Bota No. 34 is a palo cortado from Almacenista Juan Garcia Jarana and has been subsequently stored in a solera in Bodegas Rey Fernando de Castilla. Lots of orange peel and dried fruit on the nose. At this tasting it seemed surprisingly finessed, indeed almost weightless, but there was also an inescapable sense of its underlying power and intensity. La Bota No. 37 is sourced from a group of soleras from Rainera P. Marín, or more accurately, from a large amontillado solera which was created by Grupo Estévez following their purchase of the bodega and subsequent reorganisation of the existing soleras. The solera is refreshed with true manzanilla pasada and this release is sourced from a dozen butts. To me, this sherry has always had a nose that was unmistakably ‘Sanlucar’ – an inherent freshness. There was good intensity on the palate but still with beautiful balance and drinkability. The pairing of this with a bowl of mussels, sobrasada, leeks and samphire was transcendent. As the tasting portion of the evening drew to a close, we were treated to two of Equipo Navazos rare palo cortado releases – La Bota de Palo Cortado No. 47 “Bota NO” and La Bota de Palo Cortado No. 48 “Bota Punta” sourced from Gaspar Florido / Pedro Romero in Sanlúcar de Barrameda. These sherries are part of the series of releases No. 41, 47, 48, 49 and 51. In 2007 Gaspar Florido was purchased by Pedro Romero and some of the oldest sherries, which used to be marketed as ‘Jerez viejisimo‘ and absent of any other classification, were moved to the Pedro Romero bodegas where they have remained until certain casks were bottled in their entirety by Equipo Navazos. These old, rare sherries (about 50-80 years) are classified as palo cortado due to their organoleptic profile, whereas the related release No. 49 is bottled as an amontillado. There is an obvious temptation to directly compare No. 47 and 48. They are quite different sherries however. The acidity and razor-sharp edges were more pronounced in No. 47. This was a profound sherry and something of a chameleon – consistently changing in the glass – at first meaty, then suddenly bitter. Some spice emerged amidst the laser like precision. No. 48 had more up front appeal and an unusually high drinkability factor for such an old sherry. It also had amazing acidity but felt broader and more viscous than No. 47. Mouth coating. 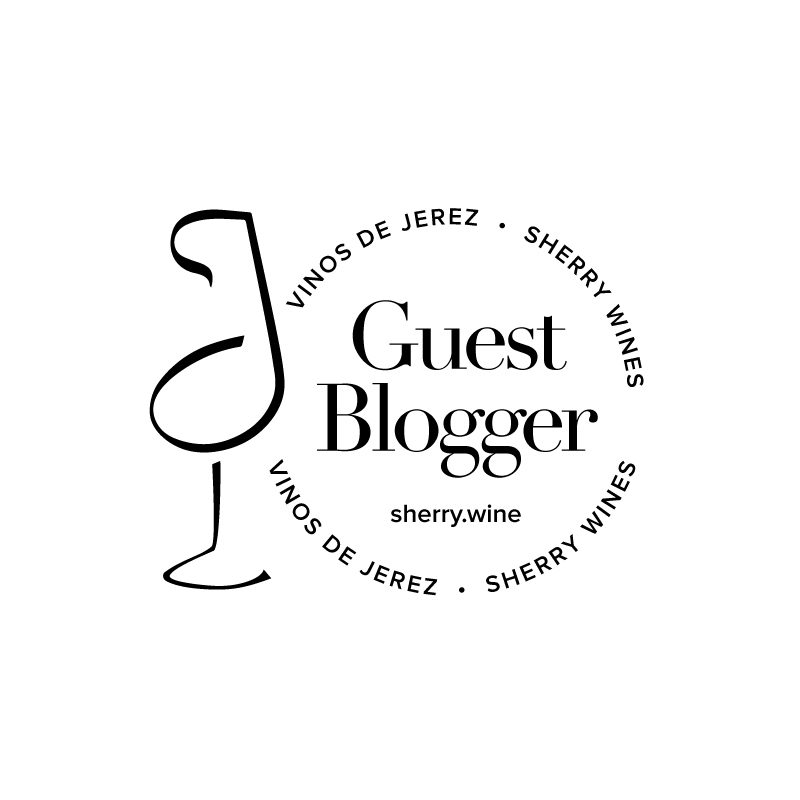 I’m not sure it’s possible to succinctly capture the essence of these two sherries in words – they are relics of history and sherry lovers should do all in their power to try them at least once. Equipo Navazos sherries are imported into Ireland by Celtic Whiskey Shop & Wines On The Green and all of the releases above, along with many others, are stocked in their shop on Dawson St. Dublin. 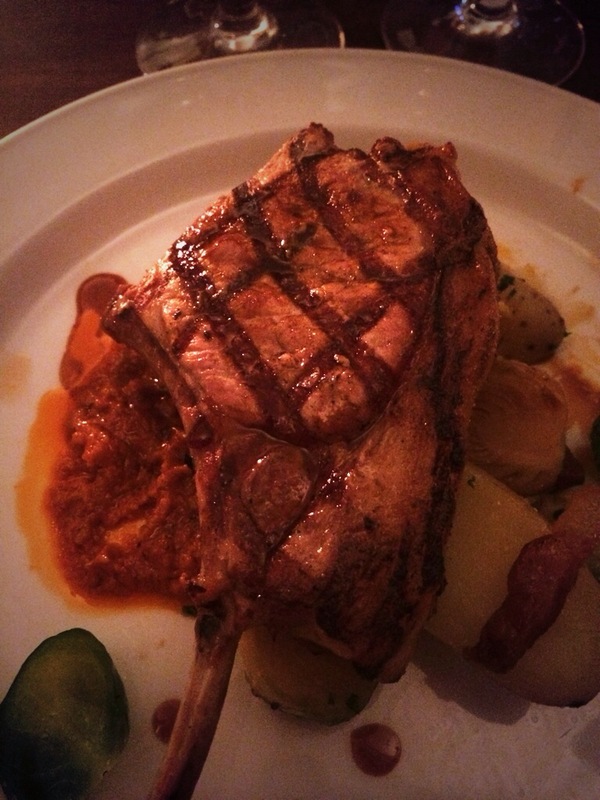 Some of the releases are also stocked in Black Pig, 64 Wine, Jus du Vine, Baggot St. Wines and Blackrock Cellar.